Good evening, one and all. My name is Anthony Trollope, and I recently received a request to rewrite the third volume of a remarkable novel which has just come to light. It is not my usual work – I am more of a writer than a rewriter -, but, as we all know, even Shakespeare wrote for money! The reason for this most peculiar task is that my editor (a fine fellow) has high hopes for this young chap; however, he feels that his writing is most inappropriate for a readership raised on good, stout English principles, and it is my duty to amend the text to make it safer, and more palatable, for the public at large. Let me tell you all a little about the author and his novel. His name, according to my editor, is Mr. Haruki Murakami, and I am led to believe that he is an educated young man from the islands of Japan. He has produced a most imaginative piece of writing entitled “1Q84”, where the title refers to an alternative 1884, one in which Japan is a most civilised country (and not the barbarian backwater it is now!). In choosing to place the action of his novel in the future, young Mr. Murakami has taken certain liberties with what is acceptable in polite society, and it is precisely this aspect of his work which I will be discussing today. The antics his characters get up to are certainly very far from the way we live now! There are two main characters in “1Q84”, Miss Aomame and Mr. Tengo Kawana, and it is with Miss Aomame that I would like to begin today. It really is an indictment on Mr. Murakami that an attractive young woman should be left unchaperoned to wander around the metropolis, and I am afraid that the disgraceful consequences which arise from this are a clear lesson to us all of the folly of giving young ladies more independence. Not content with “working” for a living, she is even permitted to live completely alone! I intend to introduce a sprightly duenna, Lady Murasaki, who will be able to keep a watchful eye on our murderous young reprobate – there will be no wandering the streets of Tokyo on her watch! I am also extremely concerned about young Mr. Kawana, a man who really should be making more of his life, what with his undoubted mental capacity and literary prowess. It troubles me to see the time he wastes on unnecessary thought, when he should be devoting all of his energies to the literary arts. A man with such an inordinate amount of leisure time and no published novel! I am currently working on three manuscripts in addition to this minor rewriting task!!! However, the moral intransigence of “1Q84” is by no means limited to our two young friends, I’m afraid. There is a wide cast of minor characters, many of whom will need to be considerably rewritten if they are not to offend the delicate nature of our potential readers. Miss Havisham The Dowager, a wonderfully-drawn widow, is perhaps one of the least offensive and morally corrupt personages, and it is wonderful to see how she has established an abode for women who have failed to fulfil their marital duties, providing them with a home until they are ready to return to the rigours of their home obligations. Perhaps we could tone down the mercilessly-seeking-out-and-killing-overbearing-husbands part though – a gentle ticking-off, delivered by an amiable policeman, should do the trick. Now, one man who would be quite at home in an English three-volume novel is the fascinating Mr. Ushikawa, the gentleman (although I use the expression in the loosest sense) with the shabby attire and a marvellously misshapen head. Despite his uncouth behaviour, I admire Mr. Ushikawa greatly. He is a most fascinating creation, and, were I to be cynical, I would suspect that our old friend Mr. Dickens might have had a role in assisting young Murakami in his formation. I really cannot see any pressing need to change his character at all; however, I’m sure my audience would enjoy his demise more if the lodgings he meets his fate in were a tad darker and even more insalubrious. There is a lot for me to work out here, but I do think that I shall be able to make a fairly passable story out of this last volume. By making the alterations mentioned above, and smoothing out a few of the rougher edges (I shall certainly be removing all of this nonsense about the ‘Little People’ – I mean, really! ), the book should be ready for serialisation within a month or so. Oh, and of course we will be adding a hunting scene (perhaps a thrilling chase after a cunning fox – or cat! – around Shibuya station? That sounds like a nice, leafy estate for a run.). I shall let you know how it all goes once I have completed the task. The document ends abruptly here. We will inform the public of any discoveries we make regarding the writing of this invaluable piece of literary history. I'm guessing this is your serious post on this subject & I would love to treat it as such, but still not read the aforementioned work. but I think Mr Trollope should gain himself an introduction to one Dr Who, because with a certain time problem ironed out, I believe a career in literary criticism awaits him. If I am to read a huge book, I'll choose Troloppe over 1Q84. Emma – This one just flowed from my fingers as soon as I sat down to write it – no idea why! There's actually a very serious side to it too though. '1Q84' has been described as Murakami's 'Victorian' novel, and I was using a Victorian slant to explore ethnocentrism, and the problems of judging something from a different culture through the lens of your own beliefs. How can it be a Victorian novel? Does it fuel the relentless question: is Murakami stil a Japanese writer? You can't avoid ethnocentrism, unfortunately. But it's also fascinating. I love reading reviews of French books by foreigners. They have a fresh look at it. Balzac doesn't come with the smell of chalk on blackboards for most of you. It makes me see the novels in a different light. And sometimes I can help with cultural references. British book bloggers also help me with British references and it enriches my reading. I've done a couple of letters (well, diary entries really) – but definitely no recipes! 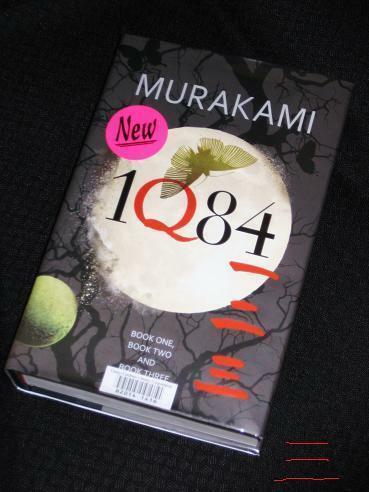 Murakami is a fan of Victorian fiction (or so I've read), and '1Q84' can be seen as his attempt to write a Victorian-style monster of a novel (but in his own, inimitable style). The idea of ethnocentrism is an important one, one I've dealt with in my university studies, and it can be easy to ignore it when reviewing an international writer such as Murakami. It's very easy to judge his writing against western standards, when he's actually writing for a Japanese audience. Are you sure he's writing for a Japanese audience? The first books, OK. But now? His books are marketed like a rock star new albums or a blockbuster. Yes, there are some differences, Effi Briest is an excellent example. The story would have been different in France. But still there's a common cultural background. PS: Recipe post is about Michael Chabon, if you want to know. This is totally hilarious and had me laughing out loud. I have only read half the first book of IQ84, and at this stage would much rather read a Murakami-Trollope mashup. Ah, I do think it's worth persevering with (although there have been a few dissenting voices around…). It's a novel with several faults, but ones that can be carried in 900+ pages.